As usual every one’s talking about what to do with left over turkey today, but what about the other left overs? 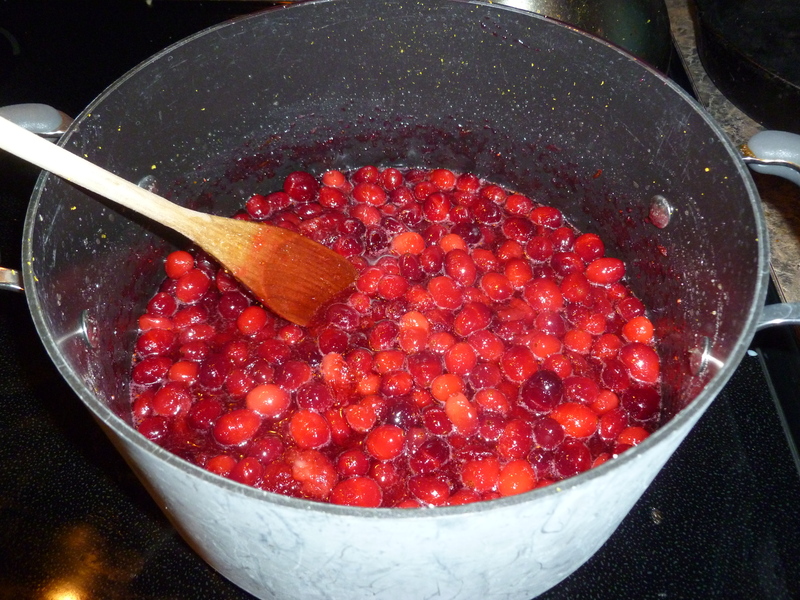 Some are easy, use rolls to make turkey sandwiches, pies disappear quickly, but what about the cranberry chutney? 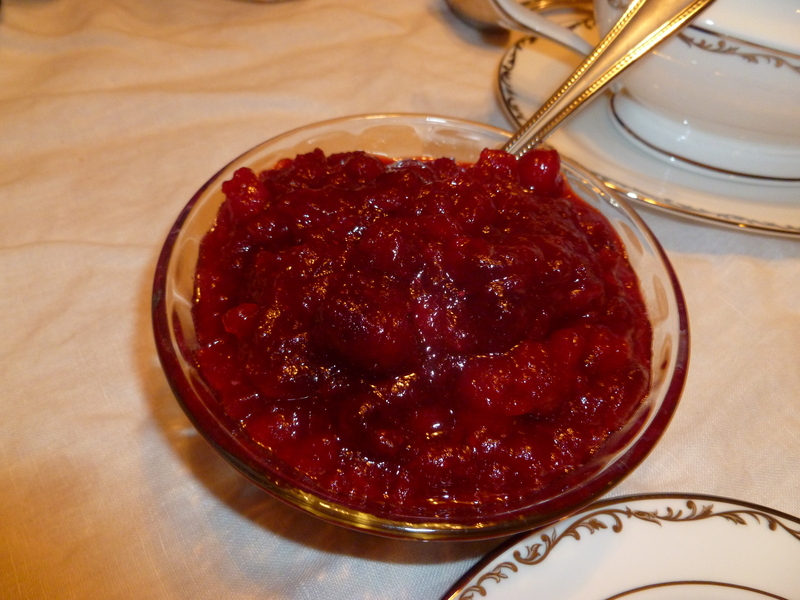 Cranberry chutney is actually a pretty good jam substitute. We use it like jam and enjoyed it on pancakes this morning. It would als be good on waffles and plain toast. If you don’t have any on hand, it’s really simple to make and extra bonus, cranberries are probably on sale today at your favorite grocer. This year we went with the recipe originally from Southern Living in J’s favorite cookbook, Cooking Up a Storm. Combine the sugar and the orange juice in a large saucepan and stir to combine. Add the cranberries and the orange zest (we just zested right over the saucepan). Turn the heat to medium and bring to a boil (lots of little bubbles) stirring often. 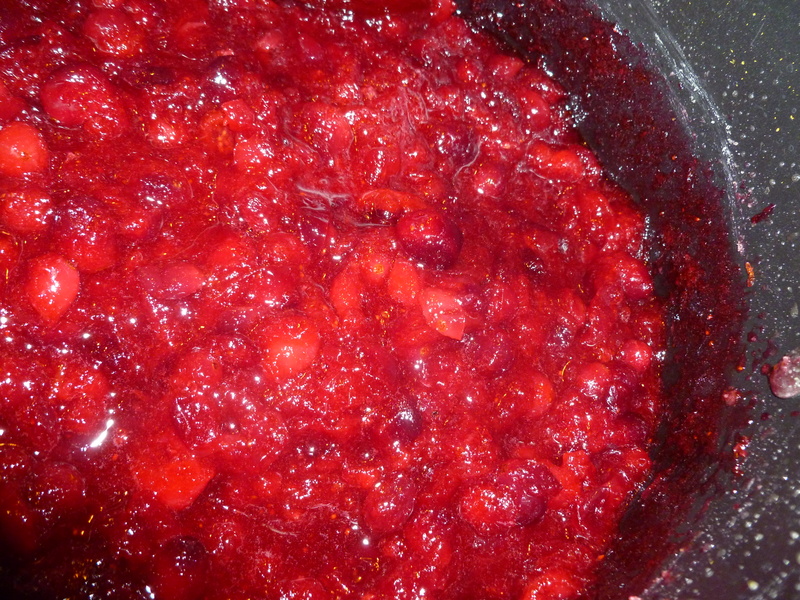 Reduce the heat and simmer for 5 minutes or until the sauce starts to thicken and the cranberry skin begins to crack (this may happen before you reach a boil, that’s ok). If you like your chutney chunky ,but not too chunky, get out a potato masher and go to town. If you prefer a smoother texture, feel free to toss in your food processor or blender. Serve warm or chilled. Way, way better than any store-bought canned chutney. It’s amazing on turkey and chicken. In fact, another left over dish we’ll be having this week is cranberry chutney covered baked chicken. The chutney has a sweet tart flavor and is great on any bread product where you would use jam. This dish will not be regulated to just Thanksgiving.